High-end retailer Brown Thomas has complained to an Oireachtas Committee about the planned Dublin quays walking and cycle route, and high parking charges — however the officially licensed Brown Thomas Car Park charges consumers more than the city council. 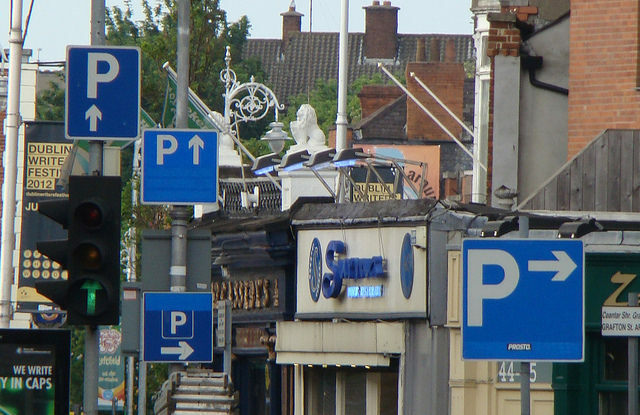 “To my mind, to make our towns and cities attractive, they must, first, be safe – customers must feel relaxed and at ease – second, clean and free of odours, litter and graffiti; third, easily accessible, including by the customer’s mode of choice, be it the car, bus, bicycle or on foot and, fourth, there must be easy and affordable parking,” said Stephen Sealey, managing director of Brown Thomas. He was speaking to the Joint Oireachtas Committee on Jobs, Enterprise and Innovation on the topic of Business Growth and Job Creation in Town and Village Centres. The retail’s own-brand multi-storey car park — owned by an unidentified independently owned company — located to the rear of Brown Thomas’ flagship store on Grafton Street in Dublin charges €3.60 per hour — that’s more expensive than the city centre on-street rate of €2.90 per hour and the city council-owned Drury Street Car Park which charges €3 per hour (See more car parks in the area compared below). Brown Thomas said on Monday evening that it has no control over the parking charges and that it does not own the car park. On spending power, however, independent research by Dublin Institute of Technology (DIT), the Report on shopper travel behaviour in Dublin City Centre published in 2011, shows that while shoppers who have travelled by car sometimes spend more per trip, people who cycle sometimes spend more on average per month and usually make more trips per month. This reflects international research on shopping by bicycle which shows shoppers traveling by bike spend more overall. In the United States, protected bicycle lanes — also known as cycle paths — have been shown to boost retail sales by as much as 49% in some locations. 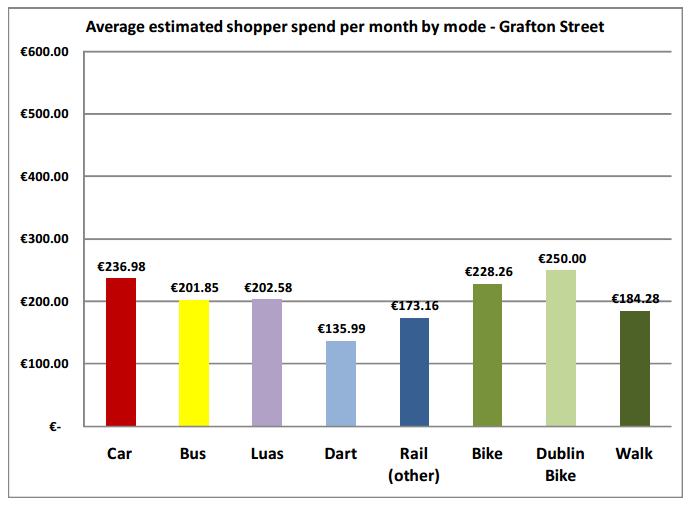 The bicycle user average of €228 per month on Grafton Street accounted for only marginally less retail income than motorists at €236. However, DublinBike users topped the survey with a monthly spend of €250. In the 2011 survey, bicycle users accounted for 9% of shoppers, just slightly below car shoppers at 10% of consumers. The numbers of people cycling in Dublin has increased since the DIT research was published and it is likely that more people also now shop by bike in the Grafton Street area, with bicycle parking at weekends in high demand. 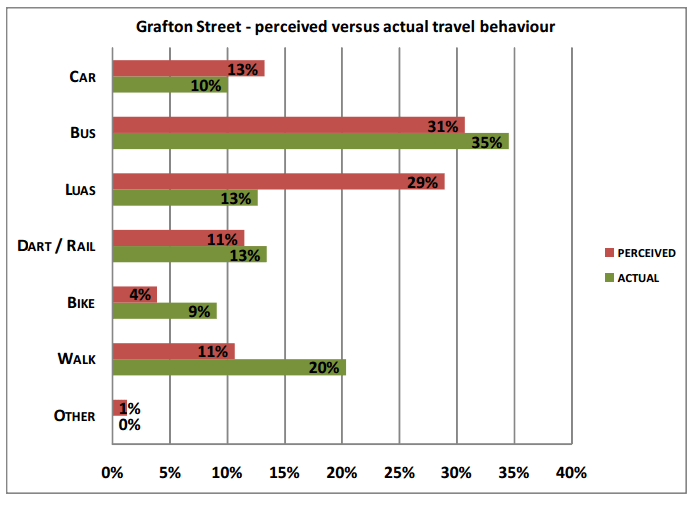 Buses transported most shoppers (35%), followed by walking (20%), rail (13%) and Luas (13%). Sealey also tried to link current and possible extra congestion due to the quays walking and cycle route project with a lack of access to retail and less sales. However, after questioning from TD Dara Calleary (Fianna Fail) on the differences between the city centre and out-of-town shopping centre stores, Sealey then admitted that the Grafton Street store is more high-end than its stores in Dundrum and Blanchardstown. Peadar Tóibín TD (Sinn Fein) called the idea of a cycling path on the north quays a “matter of life and death”. Brown Thomas has previously been reported as being against the College Green Bus Gate — at the time RTE reported that “13 businesses including Brown Thomas, Weirs, Louis Copeland as well as shopping centre and car park owners, will go to the High Court” to challenge the bus gate. Consultants CB Richard Ellis were employed by the city council to assess the economic impact of the bus gate after it was put in place, but businesses against the public transport priority measure — including Brown Thomas — refused to reveal sales date to the consultants. Historically, some city centre retailers have objected to measures such as Grafton Street pedestrianisation, which was delayed years because of retailer objections, and the original Luas project plans which included a link between the two lines. The link between the red and green lines is now under construction under the name Luas Cross City, 10 years after the tram system first opened. Car park owners in the area were also among the few businesses to object to a business-led plan in 2012 to trial pedestrianisation on South William Street, just west of Grafton Street. Stephen Sealey, managing director of Brown Thomas, said that the city center needs cheap car parking and claimed that “We need to address the issues within our control” — yet the Brown Thomas Car Park, which is licensed by the retailer and literally in their own back yard, has the second highest level of car parking charges in the areas around Grafton Street. The charges advertised on the Brown Thomas Car Park website are as follows: €3.60 for 1 hour, €7.20 for 2 hours, €10.80 for 3 hours, €15.40 for 4 hours, and €3.60 per hour after that. As well as an evening rate ofThe Fitzwilliam Dublin Hotel Car Park also on Glover’s Alley €8. Just 300 meters away, the city council-owned Drury Street offers a rate of €3.00 per hour, and evening rate of €5, an all night rate of €8, and all Sunday rate of €8.50. About 150 meters away the Trinity Street car park is €3.50 per hour; a 400 meter walk will get you to the Fitzwilliam Dublin Hotel Car Park on Glover’s Alley with a rate of €2.90 per hour and an evening rate of €2 per hour; and 300-400 meters in the other direction will get you to the Dawson Street Qpark at School House Lane with a rate of €3 per hour. We could find few more expensive examples, but these include Qpark locations at Stephens Green Shopping Centre at Glover’s Alley (at €4 per hour and €3.50 per hour after three hours) and Setanta Place, Molesworth Street (also €4 per hour). On the northside, Arnotts offer €5 for the first 3 hours parking on presentation of a valid Arnotts receipt. The Jervis Street Car Park is €2.80 per hour with a €12.00 daytime rate; and just up the road is Jervis Street Shopping Centre with the same rates plus a €5.00 overnight offer. Clarification: It was wrongly said that the Brown Thomas Car Park in the control of the Brown Thomas company, as per the comments below, the retailer only licences its name for use to the car park owner. We apologise for any confusion caused. I used to live in Ghent, Belgium when the city wanted to introduce city centre wide pedestrianisation and a great reduction of car traffic. Shops and businesses were up in arms as it would kill the city centre: “No one will come shopping anymore”. It was fortunately introduced a bit later. A few years ago a new city council wanted to bring back cars in large parts of the city centre. Guess who was greatly opposed: shops and businesses as “people will feel unsafe walking to our shops”. This time the change fortunately did no happen. I would like to point out to Cian Ginty that Brown Thomas does not (unfortunately!) own the Brown Thomas car park. This is independently owned. We licensed the name to the operator because it identifies this car park as the nearest to the store. We have no control at all over the pricing. I’ll adjust the article to reflect what you have said. Is the company or body which runs the car park registered at the store’s address? Because these seems to be no Dublin-based company other than those registered at the store’s address who are registered with the CRO as to be allowed to trade under the Brown Thomas name. The car park website uses your brand but it has no other company name or contact details on it. Business name and contact details are a requirement for business websites. A bit of a weak excuse. Maybe Brown Thomas should consider severing ties with a company that seems to be against their philosophy then. How much stronger would their argument have been when they could have shown the Car Park bearing their name has reduced prices.